Problem: In an effort to license its digital rights management patent portfolio, ContentGuard asserted nine of its patents against companies including Apple, Google, Amazon, Samsung, and Motorola in district court. In response, Apple and Google filed a combination of 35 inter partes review (IPR) and covered business method (CBM) review petitions with the Patent Trial and Appeal Board (PTAB) challenging the validity of ContentGuard’s patents. For the litigations to proceed to trial, ContentGuard’s patents would need to survive the 35 separate IPR and CBM challenges, with multiple challenges asserted against each patent. Solution: Fitch Even formed a team of experienced patent litigators and patent prosecution attorneys who worked closely with ContentGuard’s litigation counsel, in-house attorneys, and technical experts to ensure that the claim construction and patentability positions taken before the PTAB would not adversely affect ContentGuard’s infringement cases. Fitch Even’s team created and executed a comprehensive preliminary response strategy that aggressively attacked both formal deficiencies as well as the technical merits of the 35 IPR and CBM challenges. Result: Of the 35 initial petitions, only a single CBM proceeding was instituted on a subset of the claims challenged. Five petitions were dismissed voluntarily before preliminary rulings by the PTAB and 29 were denied at the preliminary stage in response to ContentGuard’s preliminary responses, with no trial instituted. In the single instituted CBM proceeding, CBM2015-00040, Fitch Even won a rare allowance of its motion to amend one of the challenged claims, as well as the first (and only) known finding of no intervening rights despite the claim amendment. As a result, every challenged claim across nine patents survived the 35 IPR and CBM challenges, with one claim being amended. This allowed the litigations against Apple and Google to proceed to trial. Fitch Even represented ContentGuard in Apple and Google’s appeal of the PTAB’s final written decision in the sole instituted CBM proceeding. The Federal Circuit agreed with ContentGuard that the PTAB applied the wrong legal standard to determine that ContentGuard’s patent qualified as a CBM patent. As a result, the Federal Circuit vacated the PTAB’s decision and remanded the case for the PTAB to reconsider whether the patent qualifies as a CBM patent under the proper standard. Problem: Fitch Even represents USG Corporation in asserting seven patents directed to proprietary gypsum wallboard formulations against a significant competitor. The patents protect foundational technology that provides important product quality and manufacturing benefits and has enabled USG to disrupt the market with significantly lighter premium wallboard products. At an early stage of the litigation, the defendant, National Gypsum, filed inter partes review (IPR) petitions with the Patent Trial and Appeal Board (PTAB) challenging the validity of each of the asserted patents. The IPR petitions alleged invalidity based on numerous references relating to gypsum wallboard and plaster compositions and were supported by extensive technical expert declarations. A preliminary PTAB determination that even one alleged ground of invalidity was reasonably likely to succeed could delay the district court litigation for years while the PTAB proceedings progressed through the trial stage and potential appeals. Solution: Through collaborations with USG’s in-house scientists and independent technical expert, it was determined that the IPR petitions relied on certain unjustified assumptions regarding the formulations and properties of compositions disclosed in the prior art references. Fitch Even supported USG’s preliminary responses with expert declarations that established the gypsum chemistry involved and exposed the technical inaccuracies underlying the challenger’s theories. This expert analysis provided a strong basis to distinguish the novel gypsum compositions, products, and methods claimed in USG’s patents from the asserted prior art. Result: After considering USG’s preliminary responses and expert submissions, the PTAB dismissed each of the IPR petitions. The PTAB noted several defects in the technical analysis provided by National Gypsum’s expert. Because the PTAB accepted USG’s argument that those defects resulted in the challenger’s failure to carry its initial burden to demonstrate a reasonable likelihood of invalidity, the PTAB properly dismissed the petitions rather than instituting trials for further developing the technical issues and legal arguments. This result allowed the litigation against National Gypsum to proceed without interruption. Since the America Invents Act (AIA) was enacted in 2012, Fitch, Even, Tabin & Flannery has represented clients in well over 100 AIA proceedings. 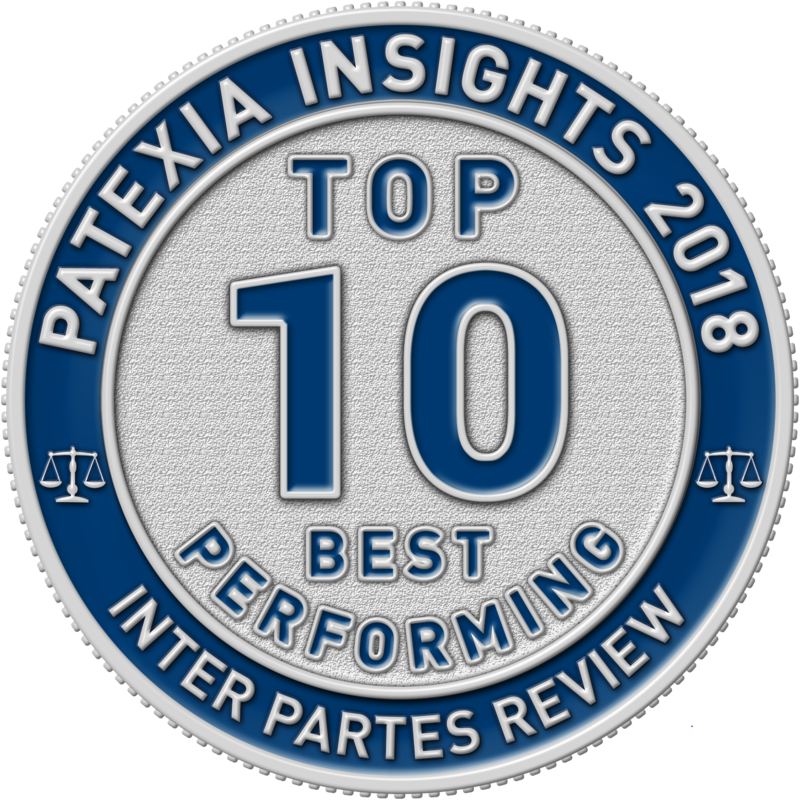 Based upon successful outcomes on behalf of our clients, Fitch Even was recognized as the number-one firm in the U.S. for patent owners in inter partes review proceedings in 2017, and Fitch Even remains a top-ranked firm today. The AIA created three new post-issuance administrative proceedings that allow third parties to challenge the validity of an issued patent before the Patent Trial and Appeal Board (PTAB). These proceedings include inter partes review (IPR), post-grant review (PGR), and covered business method (CBM) review. These AIA proceedings, and particularly IPRs, have become an increasingly popular way for accused infringers and other interested parties to challenge the validity of an issued patent. Reissue and ex parte reexamination proceedings are separate post-grant examination procedures and are discussed here. As demonstrated by our strong track record, Fitch Even is well-suited to handle AIA proceedings on behalf of both petitioners and patent owners. Our clients value our holistic approach. Working in small teams, our attorneys leverage the adversarial skills of our patent litigators and the technical analytic skills of our patent prosecutors. When our clients have existing outside litigation counsel, we work side by side with their teams to create and execute innovative strategies and ensure that positions taken in the AIA proceedings harmonize with litigation positions. We also offer flexible billing arrangements to provide our clients with top-tier service at a value that few firms can match. AIA post-issuance proceedings involve a unique blend of litigation and patent office practice. Although each proceeding has different requirements, each is initiated by the filing of a petition with the PTAB asserting that one or more claims of the challenged patent are invalid. Petitions are often accompanied by a supporting declaration from a technical expert retained by the petitioner. Fitch Even attorneys draw on extensive patent prosecution experience to draft persuasive petitions that provide detailed analysis and explicitly address the counterarguments likely to be presented by patent owners. The patent owner then has a limited time to file an optional preliminary response, which is considered along with the petition by a panel of three administrative patent judges. Identifying the weaknesses and strengths of a given petition requires deep technical understanding and an appreciation for how the PTAB evaluates petitions at the institution decision. Decisions made at this critical stage can greatly affect the likelihood of a positive outcome. Fitch Even has developed successful strategies for avoiding institution decisions whenever possible, limiting the time and resources expended by our clients. If the panel finds that the petition warrants further consideration under the appropriate standards, the panel will institute trial, which includes limited discovery, such as depositions of technical experts who have submitted declaration testimony, and further briefing by the parties. Because discovery often turns on the competing testimony of opposing experts, Fitch Even’s patent litigators offer invaluable insight to elicit testimony in support of our clients. Trial typically culminates in an oral hearing before the panel, which normally involves brief oral arguments by the parties, but no live testimony. Fitch Even’s proficiency in litigation and appellate advocacy again serves to benefit our clients at this stage. The trial is concluded with a final written decision regarding patentability of the challenged claims, which must be issued within 12 months of the institution of trial by the panel. A number of factors have contributed to the popularity of AIA post-issuance proceedings. For instance, the evidentiary standards applied in each proceeding are lower than the “clear and convincing” standard applied in district court, since there is no presumption of validity afforded a patent in an AIA proceeding. The cost associated with an AIA proceeding, while not insubstantial, is usually considerably less than challenging validity in district court. In addition, post-issuance proceedings have a relatively quick turnaround time for a decision on patentability, typically 18 months from the filing of the petition. Fitch Even clients rely on our extensive experience in developing sound and workable budgets, and some also take advantage of the customized alternative fee arrangements we offer for AIA post-issuance proceedings. Petitioners involved in co-pending litigation are drawn to AIA post-issuance proceedings for several other reasons. A court may stay the litigation pending resolution of an AIA trial, thereby delaying resolution of the underlying litigation. In addition, a petitioner involved in litigation may still challenge validity of the asserted patent in the district court on other grounds not raised in the petition, subject to certain limitations. Finally, a patent owner can be subject to prosecution history estoppel in the litigation for making arguments regarding the scope of the claims when distinguishing asserted art in an AIA proceeding. In view of these defensive advantages and others, parties accused of patent infringement often leverage AIA proceedings as part of a robust defense strategy. Fitch Even attorneys draw from a wealth of litigation experience to address the challenges of parallel proceedings, either as primary counsel in both district court and AIA proceedings or as part of the litigation team. Being relatively new, AIA post-issuance proceedings continue to evolve. Policies are being tested and the PTAB, the Federal Circuit, and the U.S. Supreme Court are each evaluating rules and procedures to balance the interests of petitioners and patent owners in these proceedings. Fitch Even attorneys are active in local and national bar associations that follow and address developments in PTAB practice, and we publish frequent IP alerts to keep clients informed of these changes. Our attorneys have been at the forefront of practice in AIA proceedings since they were first instituted and continue to stay on top of ongoing developments to better guide our clients at every stage.